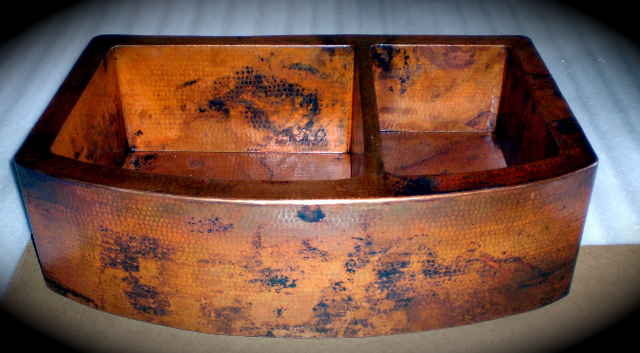 Cottaquilla Copper sells every size, weight and shape of hammered copper kitchen sink, bar/prep sink, and lavatory sink. 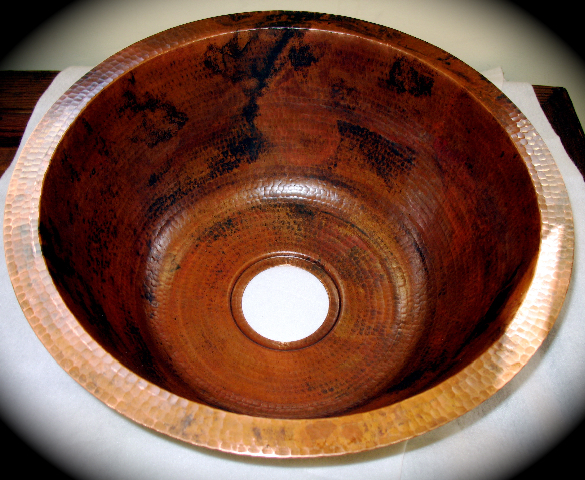 Larger sinks are made of 16 gage copper, and smaller ones of 18 gage. 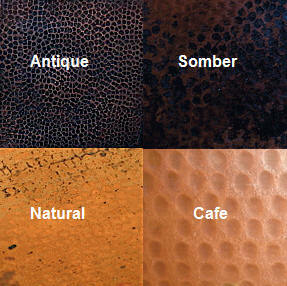 We offer a broad variety of etched motifs, and four standard patinas. Our unique emphasis on quality brings you individually inspected and beautiful pieces that your customers will gaze at with pleasure. Oval Sink medium plain 17x13"
Oval Sink medium w/motif 17x13"
Square Bar sink 15x15" lg. 7" deep. Square Bar sink 15x15" lg. w/motif 7" deep. Square Bar sink 14x14" med. 6" deep. Square Bar sink 14x14" med. 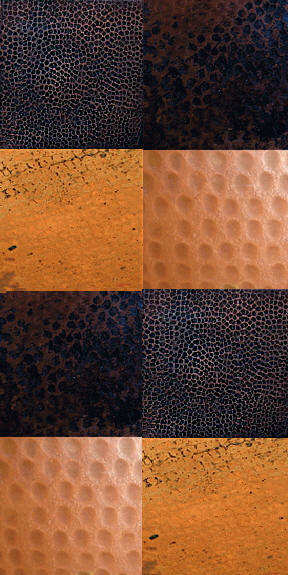 w/motif 6" deep. Square Bar sink 12x12" small 4.5" deep. Square Bar sink 12x12" small w/motif 4.5" deep. Round Bar sink 17x6" lg. 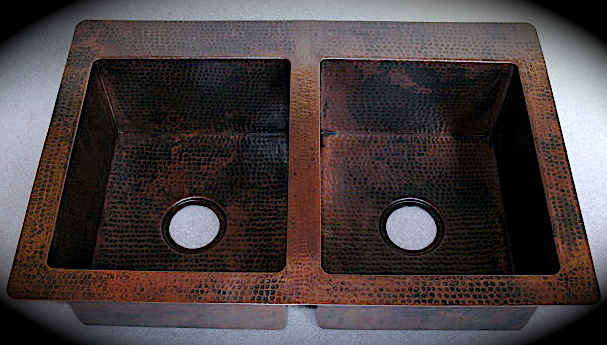 Rectangle Bar sink w/motif Lg. Round "D" Bar sink large17x15x7"
Round "D" Bar sink small 16x13x6"
Round curved flared Vessel sink rolled edge 16x5"
Round wide cazo Vessel sink rolled edge 16.25x5"
Round cazo Vessel sink rolled edge with handles 16x7"
Rectangular Vessel sink rolled edge 15x12x6.5" lg. Low square vessel sink rolled edge 15x15x4"
Oval Rome Vessel sink rolled edge jumbo 24x12x6"
Oval Rome Vessel sink rolled edge lg. 17.75x11x4.5"
Oval Rome Vessel sink rolled edge SM. 16x9.5x3.5"
Oval Vessel sink rolled edge large 17.5x12.5x5"
Oval Vessel sink rolled edge small 15.5x11.5x4"
Round vessel sink w/apron plain 17x6" lg. Round vessel sink w/apron & motif 17x6" lg. Round vessel sink w/apron plain 15x6" med. Round vessel sink w/apron & motif 15x6" med. 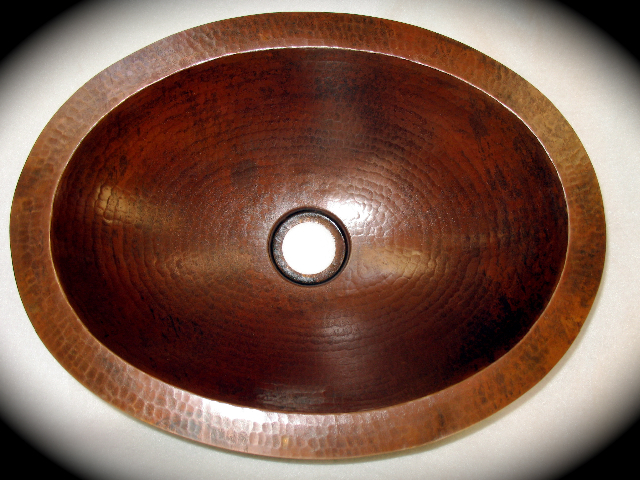 Round vessel sink w/apron plain 12x5" small. Round vessel sink w/apron & motif 12x5" small. Square vessel sink w/apron plain lg. 17x5" apron 3.5"
Square vessel sink w/apron plain sm. 14x4" apron 3"